How To Redecorate The Kids' Bedroom And Create A Space They Love - Mummy's Gone Mad! | Mummy's Gone Mad! Decorating the kids’ bedrooms quickly becomes a regular event. One year their favourite colour is blue and all the walls must be blue! The following year they decide that everything should yellow instead. Sound familiar? Yep, all families have this trouble, so how exactly do you decorate their bedroom and keep them happy? Well, it’s a fine art but we like to think we’ve cracked it. It’s their room, so we always let the kids choose the theme. We’ve had pirates, football and Disney themes through the years. They’re always fun to create, and the children love it. We found a great place that sells themed wallpaper, so you can get your hands on Disney themed patterns. You can see more designs here and pick your favourite. From there you can choose little accessories that match the theme and incorporate them around the room. The children are much happier in their rooms when they’ve helped create it. Let them get their hands dirty and learn a thing or two about decorating. Of course, it’s your job to keep an eye on their safety and supervise them. Especially if they’re handling paints or other dangerous decorating tools. Invariably there will be mistakes and funny additions to the design. We say keep them! It’s a personal touch and it’s all theirs. 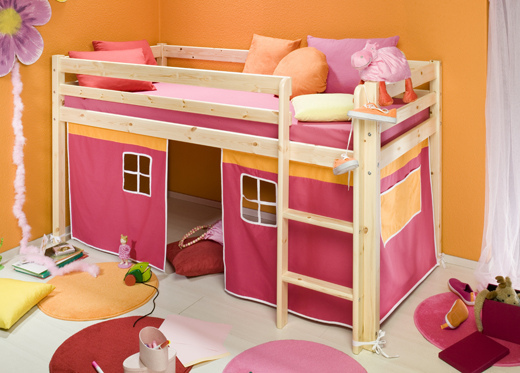 Trust us, you need a dedicated play space in their bedroom. Without one, the playspace will become your living room, your kitchen or even your bedroom. Make one corner of the room exclusively for playing. Store their toys in cases and boxes and make sure it stays in that corner. It will help you reclaim the house for yourself and keep the chaos in one small area. We bought a chalkboard just for fun and the kids loved it. Since then, a chalkboard has been a permanent fixture in the room. In fact, we’ve slowly bought bigger and bigger boards! They love to draw on it and create new, strange things. More importantly, they can practice writing and reading in their bedroom. It’s like a small classroom in the bedroom. We don’t know what it is about kids and bunk beds, but they can’t get enough. They particularly enjoy the bunk beds that come complete with a built in desk below. They feel very grown up and can draw to their heart’s content at their desk. It’s great when those first sleepovers happen too as you can easily accommodate a friend. We think it’s super important that children have a quiet space to read in their bedroom. A playspace should also include some reading aspects, so they’re always learning. We can sit down with them in the evenings, or they can curl up on their own. Either way, it works a treat. Decorating the children’s room is great because you can unleash your inner child! You don’t have to stick to interior design ideas, you can follow your imagination. Get the kids involved and get creative.